Curator/Writer: Stephen J. Williams, Ph.D.
Resistance to chemotherapeutic drugs continues to be a major hurdle in the treatment of neoplastic disorders, irregardless if the drug is a member of the cytotoxic “older” drugs or the cytostatic “newer” personalized therapies like the tyrosine kinase inhibitors. 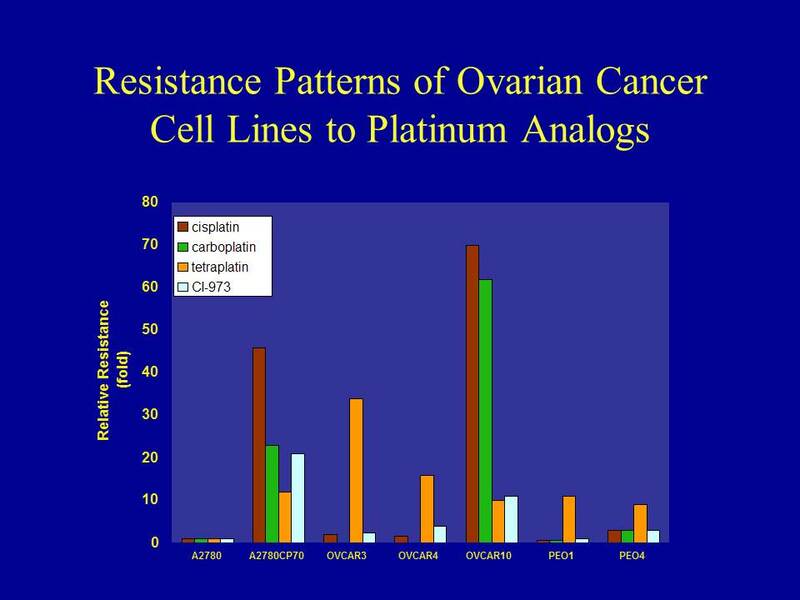 For the platinatum compounds such as cisplatin and carboplatin, which are mainstays in therapeutic regimens for ovarian and certain head and neck cancers, development of resistance is often regarded as the final blow, as new options for these diseases have been limited. Williams, S.J., and Hamilton, T.C. 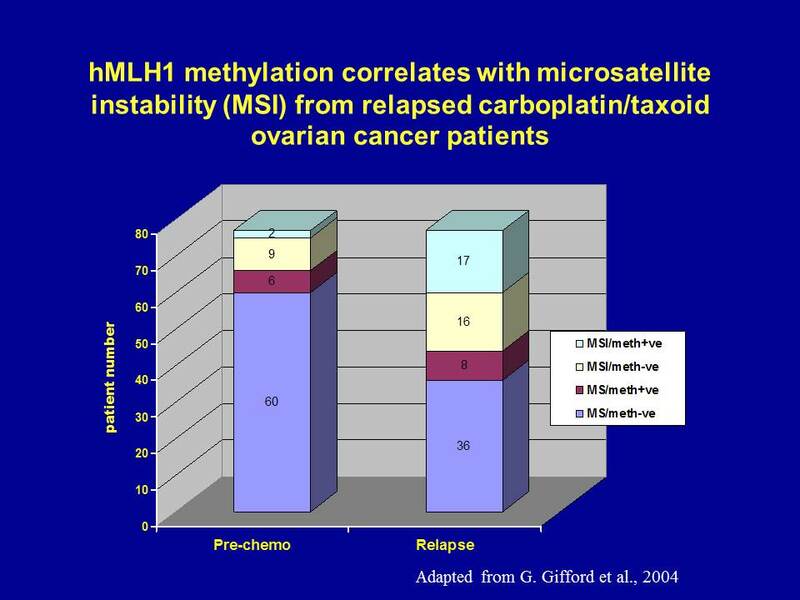 Chemotherapeutic resistance in ovarian cancer. In: S.C. Rubin, and G.P. Sutton (eds. ), Ovarian Cancer, pp.34-44. Lippincott, Wilkins, and Williams, New York, 2000. Also for a great review on clinical platinum resistance by Drs. Maritn, Hamilton and Schilder please see the following Clinical Cancer Research link here. This curation represents the scientific rationale for the development of a new class of platinated compounds which are meant to circumvent mechanisms of resistance, in this case the loss of mismatch repair (MMR) and increased tolerance to DNA damage. An early step in the production of cytotoxicity by the important anticancer drug cisplatin and its analog carboplatin is the formation of intra- and inter-strand adducts with tumor cell DNA 1-3. This damage triggers a cascade of events, best characterized by activation of damage-sensing kinases (reviewed in 4), p53 stabilization, and induction of p53-related genes involved in apoptosis and cell cycle arrest, such as bax and the cyclin-dependent kinase inhibitor p21waf1/cip1/sdi1 (p21), respectively 5,6. DNA damage significantly induces p21 in various p53 wild-type tumor cell lines, including ovarian carcinoma cells, and this induction is responsible for the cell cycle arrest at G1/S and G2/M borders, allowing time for repair 7,8. DNA lesions have the ability of to result in an opening of chromatin structure, allowing for transcription factors to enter 56-58. 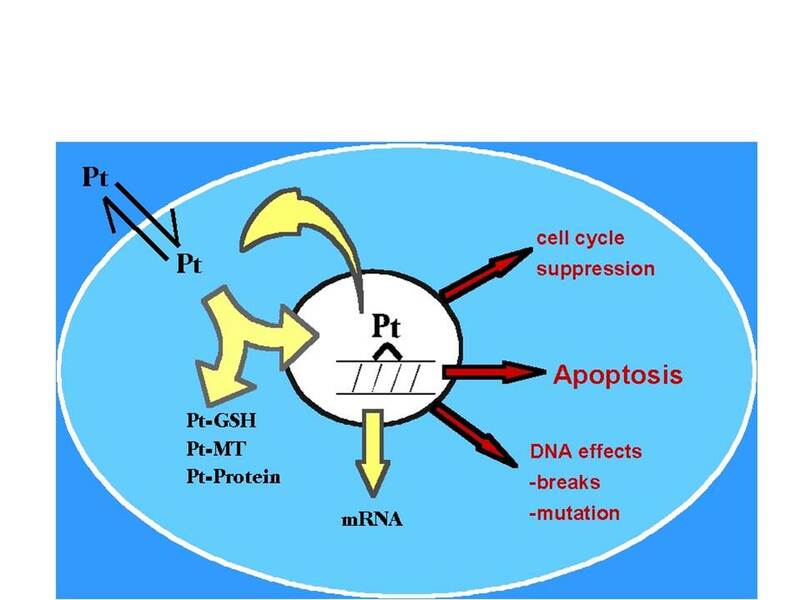 Therefore the anti-tumoral ability of cisplatin and other DNA damaging agents is correlated to their ability to bind to DNA and elicit responses, such as DNA breaks or DNA damage responses which ultimately lead to cell cycle arrest and apoptosis. Therefore either repair of such lesions, the lack of recognition of such lesions, or the cellular tolerance of such lesions can lead to resistance of these agents. 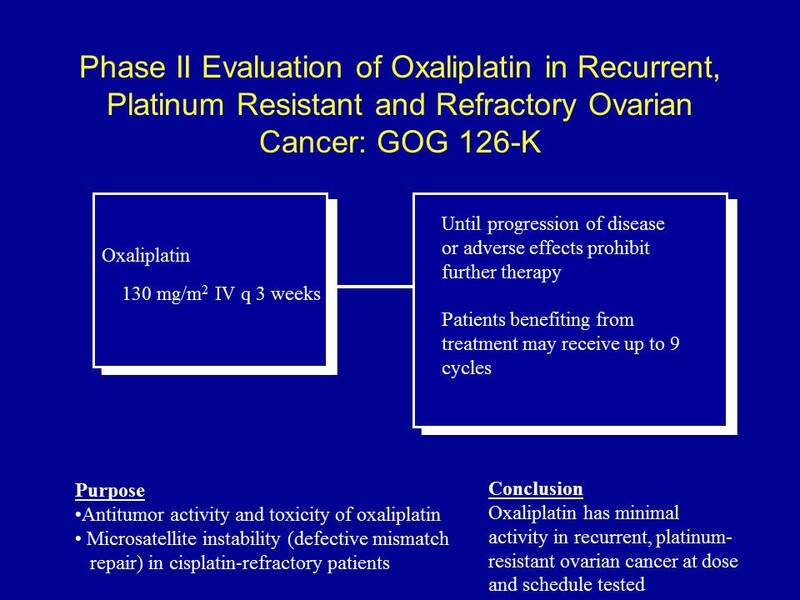 In the following Cancer Research paper Dr. Vaisman in the lab of Dr. Steve Chaney at North Carolina (and in collaboration with Dr. Tom Hamilton) describe how cisplatin resistance may arise from loss of mismatch repair and how oxaliplatin lesions are not recognized by the mismatch repair system. Cancer Res. 1998 Aug 15;58(16):3579-85. The role of hMLH1, hMSH3, and hMSH6 defects in cisplatin and oxaliplatin resistance: correlation with replicative bypass of platinum-DNA adducts. Vaisman A1, Varchenko M, Umar A, Kunkel TA, Risinger JI, Barrett JC, Hamilton TC, Chaney SG. Defects in mismatch repair are associated with cisplatin resistance, and several mechanisms have been proposed to explain this correlation. It is hypothesized that futile cycles of translesion synthesis past cisplatin-DNA adducts followed by removal of the newly synthesized DNA by an active mismatch repair system may lead to cell death. Thus, resistance to platinum-DNA adducts could arise through loss of the mismatch repair pathway. 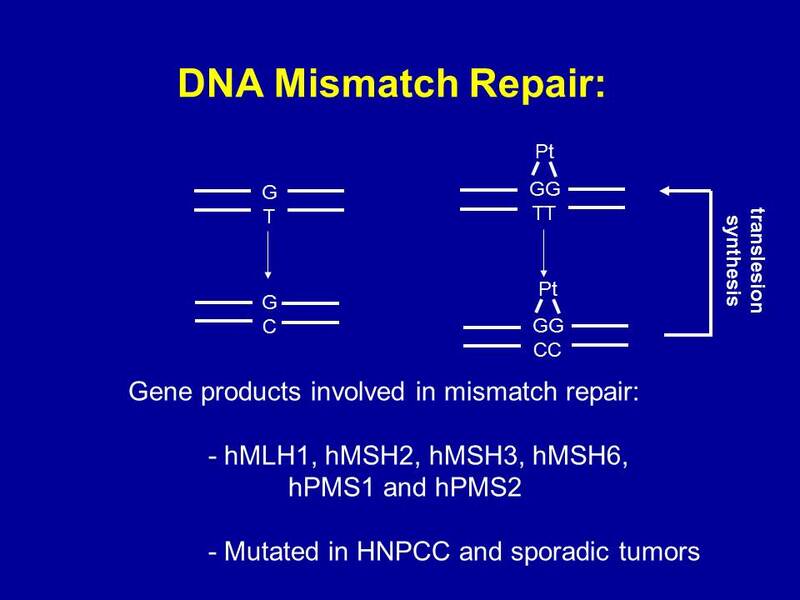 However, no direct link between mismatch repair status and replicative bypass ability has been reported. In this study, cytotoxicity and steady-state chain elongation assays indicate that hMLH1 or hMSH6 defects result in 1.5-4.8-fold increased cisplatin resistance and 2.5-6-fold increased replicative bypass of cisplatin adducts. Oxaliplatin adducts are not recognized by the mismatch repair complex, and no significant differences in bypass of oxaliplatin adducts in mismatch repair-proficient and -defective cells were found. Defects in hMSH3 did not alter sensitivity to, or replicative bypass of, either cisplatin or oxaliplatin adducts. These observations support the hypothesis that mismatch repair defects in hMutL alpha and hMutS alpha, but not in hMutS beta, contribute to increased net replicative bypass of cisplatin adducts and therefore to drug resistance by preventing futile cycles of translesion synthesis and mismatch correction. 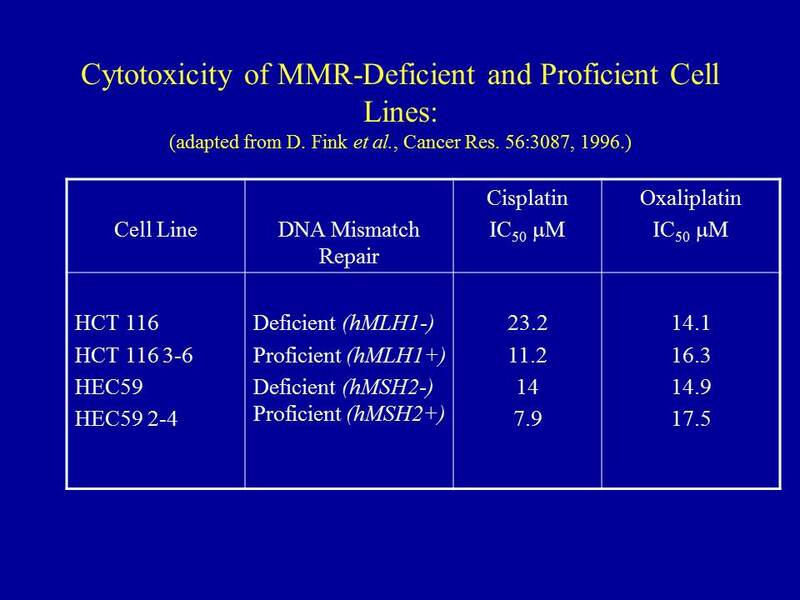 The following are slides I had co-prepared with my mentor Dr. Thomas C. Hamilton, Ph.D. of Fox Chase Cancer Center on DNA Mismatch Repair, Oxaliplatin and Ovarina Cancer. 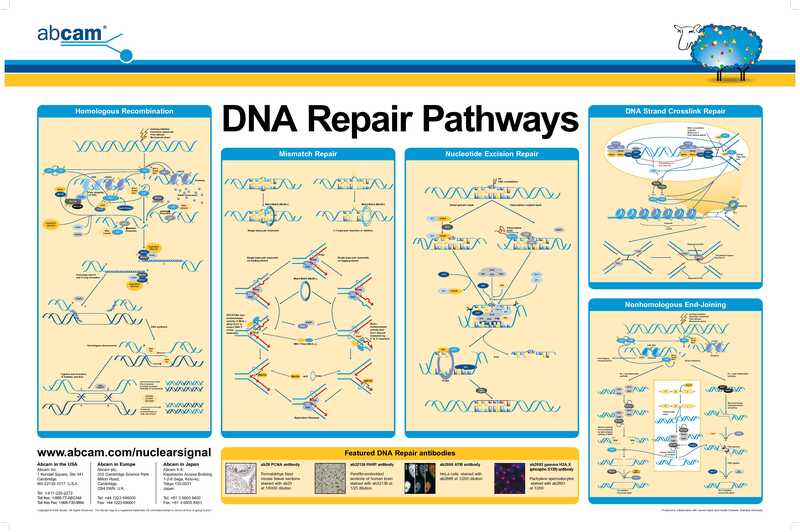 Please see below video on 2015 Nobel Laureates and their work to elucidate the celluar DNA repair mechanisms. Johnson, S. W. et al. 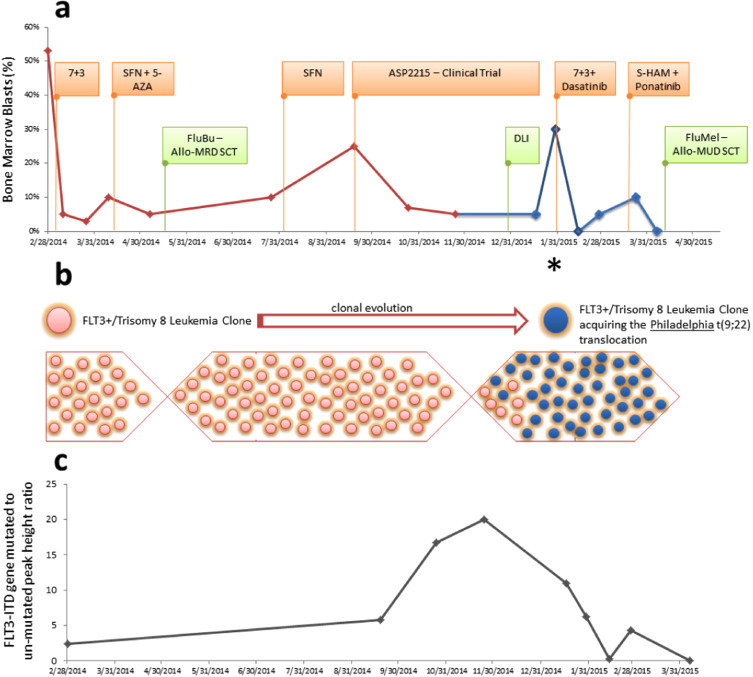 Relationship between platinum-DNA adduct formation, removal, and cytotoxicity in cisplatin sensitive and resistant human ovarian cancer cells. Cancer Res 54, 5911-5916 (1994). Eastman, A. 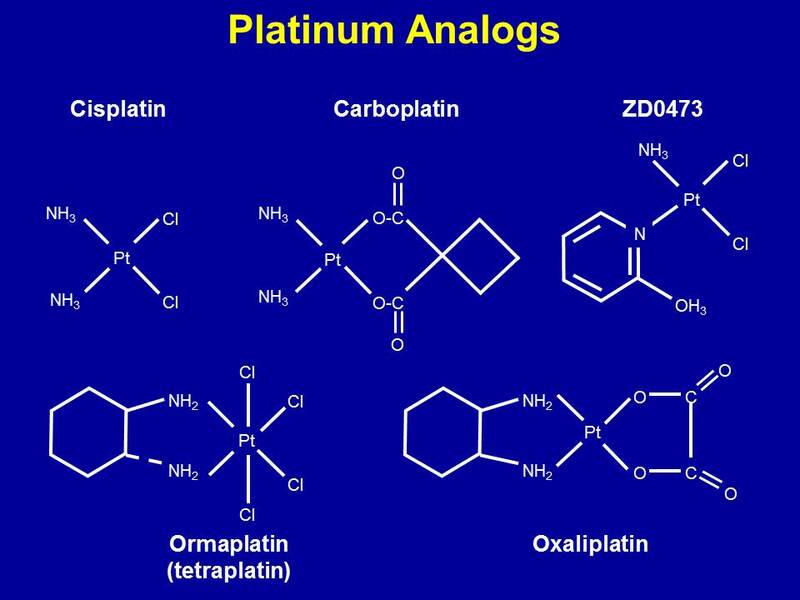 The formation, isolation and characterization of DNA adducts produced by anticancer platinum complexes. Pharmacology and Therapeutics 34, 155-166 (1987). Zhen, W. et al. 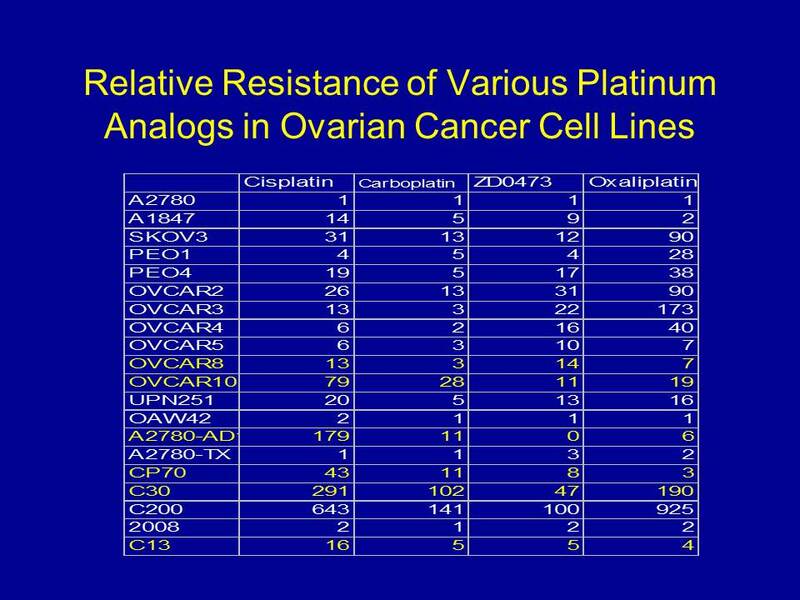 Increased gene-specific repair of cisplatin interstrand cross-links in cisplatin-resistant human ovarian cancer cell lines. Molecular and Cellular Biology 12, 3689-3698 (1992). Durocher, D. & Jackson, S. P. DNA-PK, ATM and ATR as sensors of DNA damage: variations on a theme? Curr Opin Cell Biol 13, 225-231 (2001). el-Deiry, W. S. p21/p53, cellular growth control and genomic integrity. Curr Top Microbiol Immunol 227, 121-37 (1998). Ewen, M. E. & Miller, S. J. p53 and translational control. Biochim Biophys Acta 1242, 181-4 (1996). Gartel, A. L., Serfas, M. S. & Tyner, A. L. p21–negative regulator of the cell cycle. Proc Soc Exp Biol Med 213, 138-49 (1996). Chang, B. D. et al. p21Waf1/Cip1/Sdi1-induced growth arrest is associated with depletion of mitosis-control proteins and leads to abnormal mitosis and endoreduplication in recovering cells. Oncogene 19, 2165-70 (2000). Davies, N. P., Hardman, L. C. & Murray, V. The effect of chromatin structure on cisplatin damage in intact human cells. Nucleic Acids Res 28, 2954-2958 (2000). Vichi, P. et al. 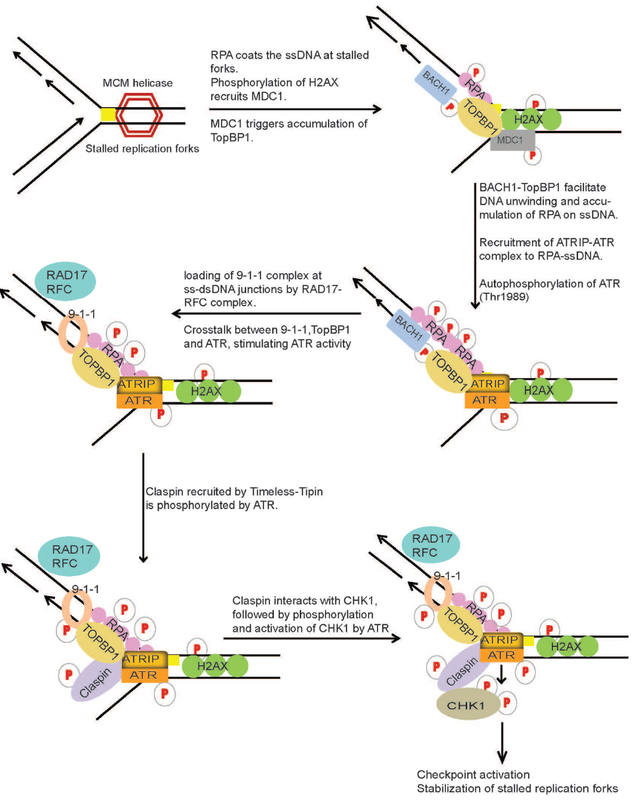 Cisplatin- and UV-damaged DNA lure the basal transcription factor TFIID/TBP. Embo J 16, 7444-7456 (1997). Xiao, G. et al. A DNA damage signal is required for p53 to activate gadd45. Cancer Res 60, 1711-9 (2000).